Real time updating of entered data means no waiting for end-of-day posting. 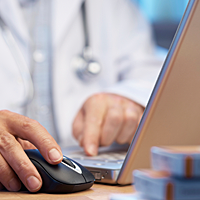 Our medical Billing and Financial Controls system ensures timely financial data availability. Handles all patient and insurance billing. Reviews each claim for electronic submission requirements & issues reports ensuring all third party charges are billed. Pop-up windows for easy entry of diagnosis and procedure codes, along with information about referring physicians and facilities. Detailed day sheets-summaries of charges and payments by category and physician. Provides a detailed patient billing history ledger.